Frankie B. Washington (born and bred in Boston, Massachusetts) has one of the most detailed artwork I have ever seen. He enjoys cheeseburgers, steaks, french fries and cheesecake but let’s not get diverted into food, although Boston has the best cheesecakes in the world. He was kind enough to run through some questions about himself and the projects he is current working on. When did you get started drawing? My earliest memory of drawing started with my first comic book which was a Marvel Comic Spiderman which I bought from a small store which used to be a school bus (seriously). I remember tracing the artwork and then from there began to naturally draw stuff. When my mother purchased groceries from the supermarket the brown paper bags became my paper of choice. Me and Dawn (my younger sister) were supported by my single mum who instilled within me a strong work ethic deprived from her southern up-bring. Drawing was the easiest thing for me and my mother would on occasion offer critiques even though she wasn’t an artist- she still had a pretty good eye for human anatomy. Did you follow up with drawing through high school? I was fortunate that during my high school years there were a few programs which catered to the arts and I made full use of them. 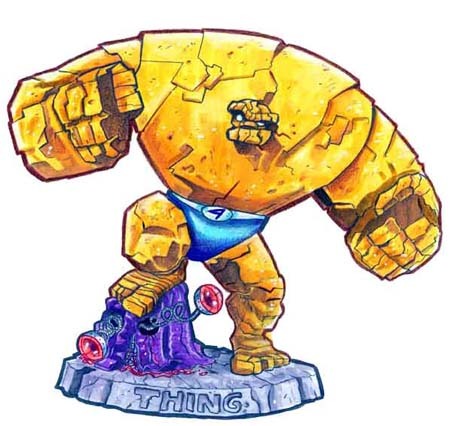 I continued to watch a lot of television and collect comic books, finding myself enthralled by artists like Jack “The King” Kirby , Berni Wrightson, Neil Adams, John Burn, Herb Trimpe, Paul Ryan and the Buscema brothers. In my head when I am illustrating, I mentally have in the back of my mind the styles of John Byrne and George Perez – I love drawing lots of detail. Dreaming of drawing a multi-character scene that can sit in the same place in history as the stuff done by Perez, Geoff Darrow and Alex Ross. That’s a great who’s who of the best comic illustrators. I think all their work is great especially Alex Ross. 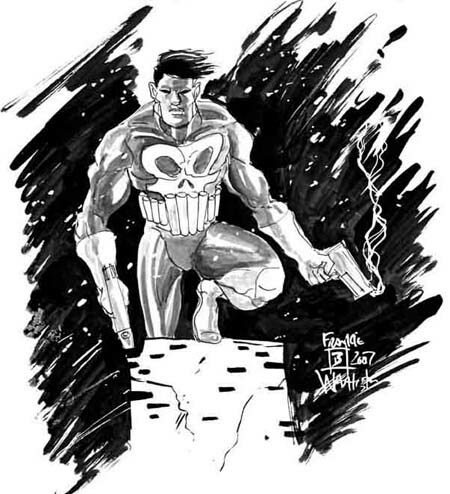 I have put up 2 samples of your work : Fantastic Four’s Thing and Punisher. Another two of the artwork you provided were Atomic Robo. Can you tell me more about that? First off- Atomic Robo is an amazing series done by my friend Scott Wegener and Brian Clevinger (http://www.atomic-robo.com). I asked Scott if he would be interested in a pin-up and he was cool with it. 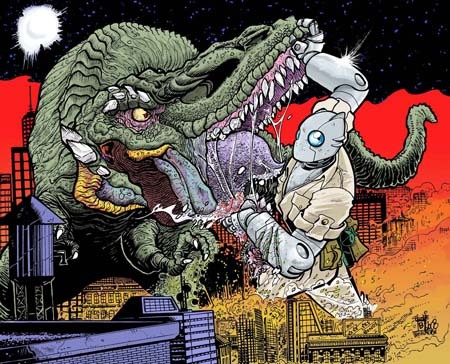 I did a giant monster scenario with Atomic Robo fighting a giant lizard creature and he loved it. He said that it would be appearing in Atomic Robo vol 2 TPB – so I’ll wait and see if it makes it. 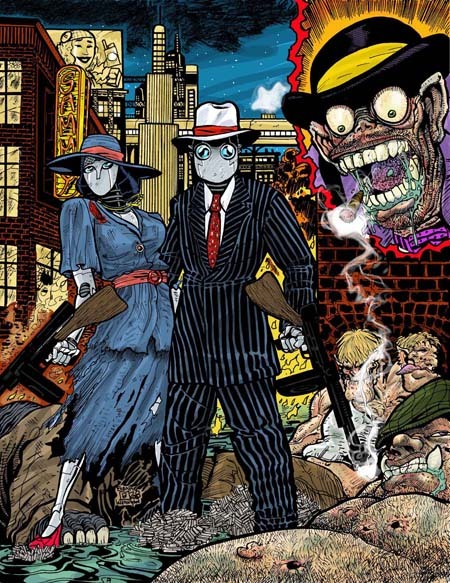 I also did another pin-up with Robo as a gangster in the 1930’s. It will be fun seeing the pin-ups in the TPB when it comes out- fingers crossed. Both pictures are very detailed. The colouring really adds something to the work. Are there any projects you are working on at the moment? I am currently working on 2 projects very close to me. Firstly Project One is a comic book concept that I helped to create with my writer friend Chad Lewis (http://shoxstudios.com) who currently has two titles on the Shox website called “Devil’s Child” and “When Ages Collide”. The concept he and I created was conceived four years ago but this past August was dusted off and we are currently in the development stage with it. This comic book series will definitely push my skills when it comes time to start drawing. Project Two is called “Da Otha Gurl” – a unique concept which was born from a conversation me and wife, Crystal, had about her past experiences in high school. I was intrigued by her story and found myself drawing female characters that personified her feelings of “Being The Other Girl” or outsider who doesn’t fit into any cliques. Crystal and I, see ourselves as eclectic minded persons so Da Otha Gurls are a representation of the eclectic who is making their way in a world set in rules. She and I are currently working on drawings and have opened two online stores (Zazzle and CafePress). More of Frankie’s work can be accessed through his website http://www.frankiebwashington.com. For commission information and pricing please email him directly at turtle.totem [at] comcast.net and any enquiries will be responded to. Unfortunately I have received an update that due to publishing constraints, all Atomic Robo pin-ups have been removed from Vol2 TPB. Posted: January 11th, 2009 under art, comic, Featured Artist. Definitely! When your series is completed, I will definitely be able to post it up for you. My husband is the most creative, hard working and driven individual I have ever met. I am always amazed by his skills as an artist as well as his ability to draw people into his world of intense imagination. He is truly a gifted man. 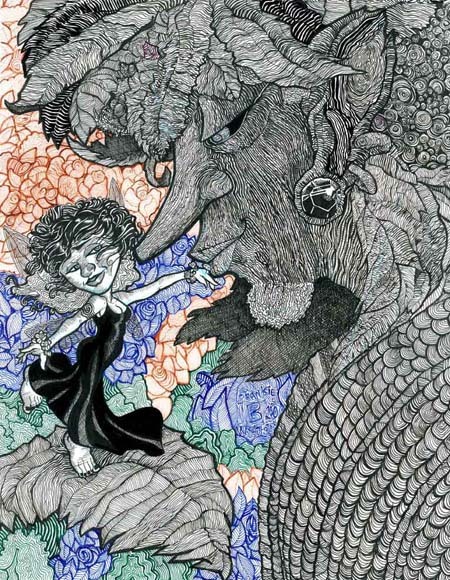 Frankie is one of the most talented comic illustrators in the business today. He has a passion for his creations that is unsurpassed on this side of the universe. Keep doing it Frankie, we love it. Your the best. Frankie, your work is wonderful, i am so glad i met in that expo in New York last year, what an honor to have one of your drawings, the one you gave me!! you are one of the bests! You’re lucky to have one of his original drawing! Frankie B, you have a unique style of art that really gets your attention. I visited your website and was impressed with your body of work. Keep up the good work.